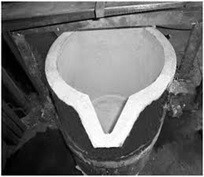 Alumina based clay bonded or phosphate bonded plastic refractories for induction furnace spouts. Oxidizing conditions flux that prevents the gas pickup in the melt. Reducing conditions flux that prevents oxidation and zinc loss during brass melting. Flux for protection during melting and for the aluminium oxides removal from the melt. Reducing conditions flux that prevents oxidation and zinc losses during fine brass melting. Flux that removes excess aluminium from the melt. Coagulant flux for slag removal. Tablets for the removal of gasses from the melt and to prevent the formation of pores and inclusions in the castings. For the removal of oxygen and oxide inclusions. 1. 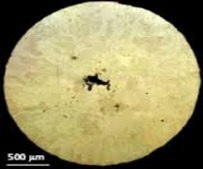 We melt the metal under a cover of an oxidizing atmosphere flux HALCOREX in proportion 1%. HALCOREX flux is added during the initial stage of melting. 2. 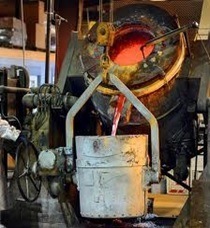 The slag that was formed upon completion of melting is removed using the deslagging PERLAX flux. 3. We deoxidize the melt using a deoxidant CuP15% by immersing tubes with this deoxidant deep inside the melt. We always should care to paint the metallic tools with the protective coating TOOLCOTE. 4. 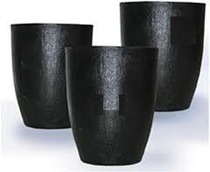 We cast the metal in sand moulds resin bonded with the minimum possible resin content to avoid possible gas defects. 1. We melt the metal under a cover of a reducing atmosphere flux BRASSIT in a proportion 1% to avoid Zinc losses due to oxidation. 2. 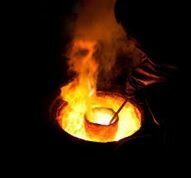 If Brass alloy has been contaminated with Aluminium up to 0.5%, we can remove the Aluminium from the melt by adding and stirring ALUMINAL flux in a proportion 0.5 Kg for every 100 Kg melt. 3 We deoxidize the melt using a deoxidant CuP15% by immersing tubes with this deoxidant deep inside the melt. We always should care to paint the metallic tools with the protective coating TOOLCOTE. 1. Brasses cast in metallic dies always contain Aluminium that is readily oxidized to oxides inclusions that reduce fluidity and for this reason it is necessary to remove these non metallic inclusions. 2. We melt the alloy under a cover of a flux BRONZAL in proportion 1 Kg for every 100 Kgs melt. BRONZAL is added during the initial stages of melting (pasty condition). 4. 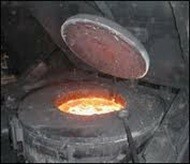 We cast at temperatures between 1150 0C to 1200 0C . 5. 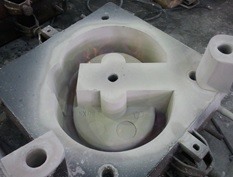 The die face is spray coated by using a refractory and lubricating coating ALUCOTE. Bronzes are sensitive to absorb Hydrogen gases during melting. These gases are expelled during solidification and appear as holes and pores in the castings. Hydrogen gases are removed from the melt by degassing the melt with ring type tablets of DEGASIT. These tablets disintegrate in the melt and produce a huge inert gas stream that expels Hydrogen gases out. Aluminium is a deleterious element in sand casting since it is easily oxidized forming non metallic inclusions oxides that are trapped in the melt resulting pores and pressure leakage casting defects. Aluminium is removed treating the melt with ALUMINAL flux in a proportion 0.5 Kg for every 100 kgs melt. 1. We melt the alloy under a cover of an oxidizing atmosphere flux HALCOREX in a proportion 1 Kg for every 100 kg melt. HALCOREX is added during the initial stages of melting. 2. We degas the melt from dissolved gases by immersing deep inside DEGASIT tablets. 3. Immediately before casting we deoxidize the melt using a deoxidant CuP15% by immersing tubes with this deoxidant deep inside the melt. We always should care to paint the metallic tools with the protective coating TOOLCOTE. 2. The oxidizing conditions during melting prevent the absorption of Hydrogen gases. If for any reason the melt needs degassing we immerse deep inside DEGASIT tablets for gas removal. 3. We add the necessary quantity of Phosphor in the form CuP15% tubes or Phosphor master alloy wafles. 4. We deslag the melt surface using PERLAX flux. 2. If needed we degas the melt from dissolved gases by immersing deep inside DEGASIT tablets. 4. We bring the melt at the correct temperatute , we deslag with PERLAX FLUX. Excellent Copper-Aluminium alloy with high mechanical properties and resistance to corrosion. Aluminium Bronzes are susceptible to Hydrogen pick-up and heavy dross formation through melting, so good melting and casting practice is necessary for sound and defect free castings. 1. We melt under a cover of BRONZAL flux in a proportion 1 Kg for every 100 Kg melt. BRONZAL flux is added during the initial stages of melting. 2. 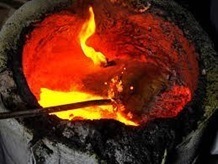 When completely melted we add some more BRONZAL flux and we stir very well and deep inside in order to remove Alumina and oxides inclusion up to surface. 3. We leave the melt still for 2-3 minutes. Then we immerse deep inside the melt Deoxidant MnB based in Manganese/Boron. The tools must be painted with the protective coating TOOLCOTE. 1. We melt under a cover of HALCOREX flux in a proportion 1 Kg for every 100 Kg melt. HALCOREX flux is added during the initial stages of melting in proportion 1 Kg HALCOREX for every 100 Kg melt. 2. We degas the melt from dissolved Hydrogen gases by immersing deep inside DEGASIT tablets. 3. We deoxidize the melt using a Deoxidant Magnesium based by immersing this deoxidant deep inside the melt. We always should care to paint the metallic tools with the protective coating TOOLCOTE. (ATTENTION : We should not use Copper Phosphor deoxidants since Copper-Nickel alloys harden with the addition of Phosphor.